BRONX — From canoeing along the Bronx River to watching the sunset in Wave Hill, summer in the Bronx is full of options for warm-weather fun. Those looking for an aquatic adventure without leaving the city can take a canoe trip on New York's only freshwater river thanks to the Bronx River Alliance. These trips generally run from May until late October or early November and leave from Shoelace Park, Concrete Plant Park or Starlight Park. Boaters need to register in advance for the $25 voyages from Shoelace and Concrete Plant parks, which take about two to three hours. The trips out of Starlight Park take only about 15 to 20 minutes and are much more relaxed. "It’s an opportunity for people just to get out with their family — maybe beginner paddlers — and they’re free," said Bronx River Alliance spokeswoman Maggie Greenfield. "People just come to the park. It’s first-come, first-served." These trips are meant to help people get a sense of the Bronx River's history and ecology — and recognize that it exists. "A lot of people just don’t realize that we have this tremendous natural resource right in the middle of the city and that you can take paddling trips right along the middle of the Bronx River," she said. "I think for a lot of people, that’s really surprising." The Bronx River runs right through the New York Botanical Garden, which offers plenty of activities of its own during summer. In addition to sightseers who are content to look at the rose garden or sit by the river, the park also hosts family dinners where chefs from Mario Batali's restaurants cook a three-course, family-style meal for the event's attendees. "It’s a cooking demonstration," said NYBG spokesman Nick Leshi. "It’s interactive so you can ask questions and it’s really intimate in the family garden." The dinners take place on July 27, Aug. 10, Sept. 14 and Sept. 21 from 5 to 7:30 p.m. Tickets are $85 for adults and $35 for children. The garden is also a good place to do nothing on gorgeous summer days, according to Leshi. "If the weather is nice, it’s just a great place to come and enjoy the grounds," he said. 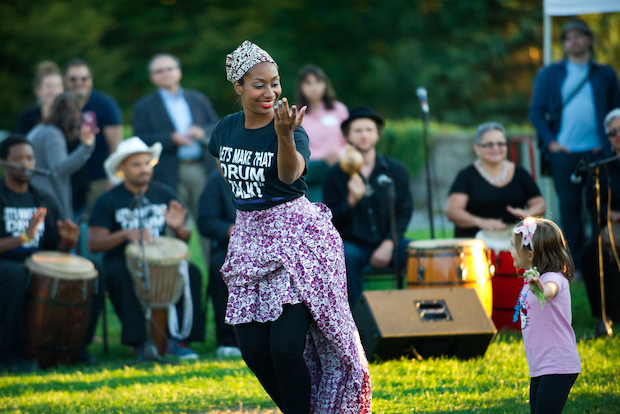 Other gardens in the borough will host a series of free hip-hop concerts this season, courtesy of the Bronx Museum of the Arts and the New York Restoration Project's Arts in the Garden Program. Shows will take place on July 26 at 6 p.m. at the Target Bronx Community Garden in Highbridge and on July 17 and Aug. 2 at 6 p.m. at the Willis Avenue Community Garden in Melrose. They will feature local hip-hop artists such as Circa '95 and RDACBX. Bronxites will also have a chance to see outdoor films this summer. Community Board 4 is hosting family-themed movie nights at sunset in Joyce Kilmer Park on Friday, July 18 and Friday, Aug. 15, while the Bronx River Alliance is screening "Over The Hedge" on Thursday, July 17 at 8:30 p.m. in Starlight Park. New Yorkers who are looking to venture further north in the borough can check out Wave Hill in Riverdale. The public garden will hold Sunset Wednesdays every week through Aug. 13, when it will stay open until sunset with concerts from Bronx-based musicians on the Great Lawn and art on display in its Glyndor Gallery. Tickets for Sunset Wednesdays are $10 for adults, $6 for students and seniors, and $4 for children 6 to 18. Members and children under 6 get in for free. Although Wave Hill is just 28 acres, park spokeswoman Martha Gellens stressed that the the small size does not detract from its views. "It overlooks the Hudson River and Palisades," she said. "So even though it’s small, it has a tremendous sense of vista. You have a sense of really being able to breathe deeply." Wave Hill is also a good option for New Yorkers looking to launch a summer romance, Gellens continued. "It’s a great place to come on a date because it’s quiet and there are lots of corners to go and sit if you want to get to know each other," she said.